Happy 2017, derby fans! 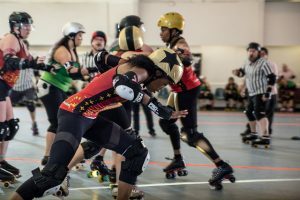 If by some horrible chance you missed our February bout, let me be the first to tell you that you missed some of the most exciting, crazy bouts that the temple has seen in a while! 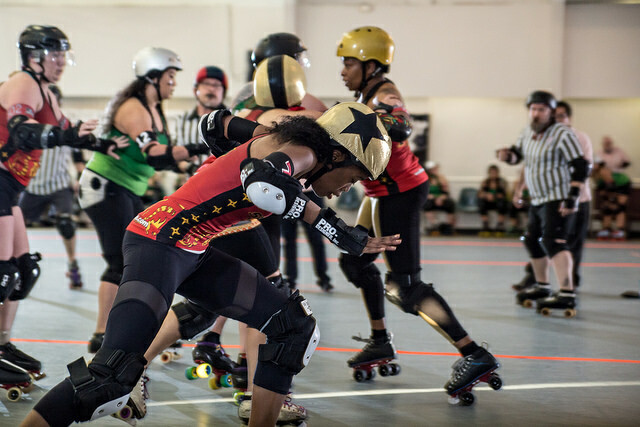 Not only did our Jukes take an amazing win against Muscogee, but our newly chartered all-stars and Rumble Bs went head to head in an IL mashup that kept everyone on the edge of their seats until the very last jam! 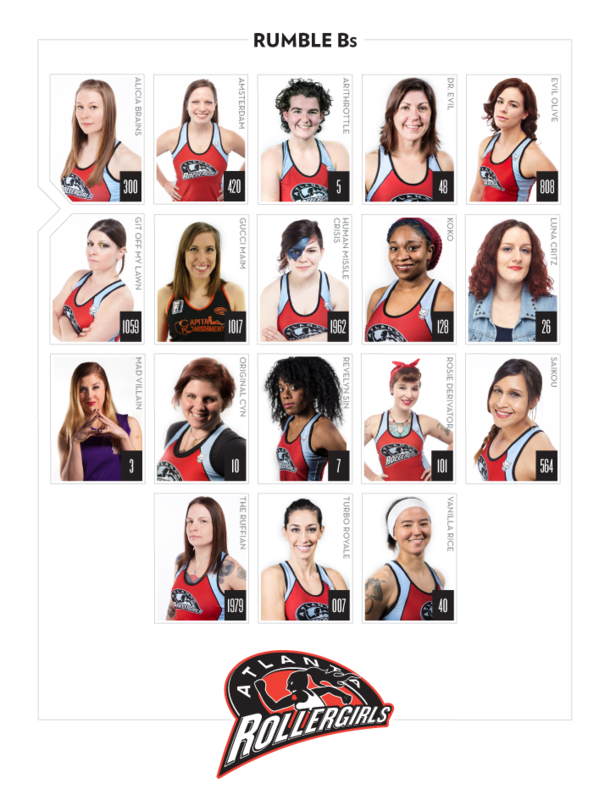 If you were at the bout, or if you follow us on Facebook, you’ve gotten the sneak peak of those charters already. If not, here is our 2017 Rumble Bs charter, with an interview from a couple of our Bs! Gear: Riedell 965s matched with white, Sure-Grip Avenger DA45 magnesium plates. 187 Pro knee ads, some ragged elbow pads and wrist guards, all held together by a healthy amount of duct tape. Then, of course, the obligatory helmet (S1). 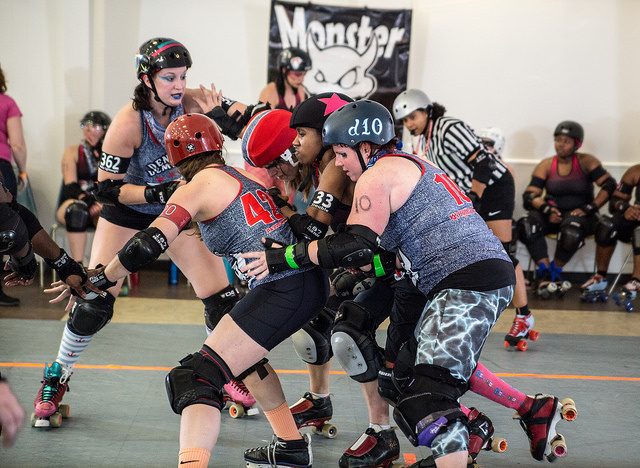 Greatest Derby Moment: Beach Brawl 2015 in Ft. Lauderdale, Florida with the Tragic City Rollers. 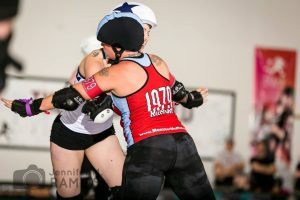 Last jam of our bout against the CenTex Rollergirls. Scores were head-to-head, and we started off with only two blockers on the track (Eiffel Power and myself). She could tell I was freaking out about covering those lines while she braced me. She looked at me and said “We can do this” all calm and collected, she’s so good at that. We killed it. It was magical. Gear: Riedell 495 with Powerdyne Reactor plates. Radar Presto Wheels, Pro Design Knee, Elbow and Wrist guards, Bern Helmet. Gladiator mouth guard. Greatest Derby Moment: Jumping (and landing) my first apex jump in my first ever game circa 2013. Somehow I won MVP jammer my first ever game. Gear: Galaxy colored Bont Hybrid Carbon boots, Pilot Falcon Plates, Vanilla Backspin/Synergy Wheels. Greatest Derby Moment: My first WFTDA game scoring pass and/or my first time jamming in a WFTDA D1 game. Gear: Bont Hybrid Carbon Boots with Pilot Falcon Plates and Atom Boom Wheels, Rector Fat Boy Knee Pads, Atom Supreme elbow pads, 187 wrist guards and a custom Triple 8 Helmet painted by my boyfriend, The Gooch of Atlanta Men’s Roller Derby. 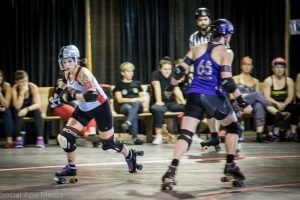 Greatest Derby Moment: Skating in three hard fought games and securing a Bronze medal with the Rumble Bs at Sting of the Hill, the 2016 B Team Championship tournament.